The Contour+ (or Contour Plus) is Contour's flagship helmet camcorder, offering a wider 170° angle of view, wireless streaming capability, and a sharper lens. Think of the Plus as a horizontal rather than vertical evolution—particularly where picture quality is concerned. Compared to Contour's earlier top-of-the-line 1080p camera, image quality is only modestly better and in many cases essentially identical. Nonetheless, there are a few significant changes worth noting. The big addition to the Contour Plus' feature set is streaming video. You can now directly connect the Contour Plus to a TV via an HDMI cable and stream a live picture, or stream video wirelessly to your iPhone or Android device (note: iPhone users will need an accessory hardware card, purchased separately). Streaming video capability, especially via a portable device, proves to be immensely useful with the Plus. No longer will you be forced to blindly and endlessly reposition the camera to get it correctly aligned on its mount. Alas, however, you will still struggle with the same fundamental issue with the basic Contour mount systems, which is that they don't offer 3-dimensional adjustability. For a head-to-head test, I took the Contour Plus and my GoPro Hero2 to Pacific Park to shoot some roller coaster footage. Right away, you'll notice that the Contour Plus' 170° angle of view is visibly narrower than the GoPro's 170° view. Why don't the specs match? In 1080 mode, the Contour Plus shoots only a 135° picture. Advantage: GoPro. As with earlier Contour cameras, color accuracy is subpar. The GoPro is clearly producing more natural and pleasing colors. Yes, Contour Plus footage can be color-corrected, to some extent, via editing software, but it's always better to get good color right out of the box. 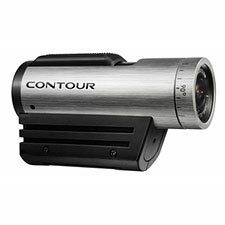 In this regard, the Contour Plus does give you the ability to select a manual color temperature, ie, Daylight or Cloudy. In practice, however, I didn't find these settings to be significantly more accurate than just keeping the camera on Auto—though they will prevent the dreaded white balance 'drift' that sometimes plagued my Contour 1080p model. As mentioned, the Contour Plus comes with an upgraded lens offering improved sharpness. Specifically I see much better corner sharpness compared to the old 1080p model. Center sharpness is for the most part the same. How does sharpness compare between the Contour Plus and the GoPro Hero2? That's an interesting question. Put both cameras on a tripod and shoot a static scene, and the Contour Plus gives a noticeably clearer, sharper picture. But look again at the comparison footage and notice how much trouble the Contour Plus has with motion—visible and often severe motion artifacts are evident, including compression noise and CMOS sensor skew. I will partially explain the GoPro's advantage in motion rendering as being due to its wider angle of view, but that doesn't explain the compression artifacts. Simply put, the Contour Plus' h.264 encoder isn't as good. Taking all these issues as a whole, I feel most users will get more pleasing video footage with a Hero2 in most situations. These picture quality differences, however, are modest, and perhaps unlikely to convert existing Contour users. For me, the Contour Plus, like its predecessors, remains a quirky and sometimes confounding camera that makes it difficult to achieve consistent results. Four years have passed since the introduction of VHoldR's 'Contour' helmet cam, and in that time video imaging technology has advanced tremendously. In that same time, Contour's cameras have advanced only incrementally in terms of picture quality. I think it's time for a game-changer—and this isn't it.